The explosion in popularity of social networking sites like Facebook and Twitter have led to tons of new, creative ways for Christians to build relationships and share their faith with people online. Each of the next 20 weekdays, some fantastic guest bloggers and I are going to share and discuss one creative Internet evangelism idea each day. That’s 20 ideas from 12 bloggers in 20 days. 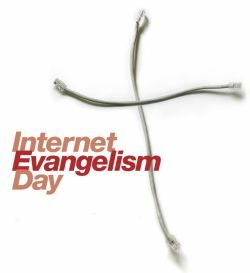 The purpose of this group blogging project as well as Internet Evangelism Day is to raise awareness about the opportunities each of us has to use some facet of the Internet to share the good news of Jesus Christ with others. If that gets you excited, here are 5 ways you can get involved. But before I got to those 5 things. I want to give a big shout out (and some link love) to the following bloggers who will be contributing ideas. Edit 4/5: I’m going to continue to update this post with links to each of the 20 ways to share your faith online. Follow @OurChurchDotCom on Twitter and retweet the link for each idea. Share some (or all) of the ideas with your Facebook friends. Discuss the ideas in the comments. Share any related ideas. If you’re a pastor, communications director, evangelism coordinator, or small group leader, engage your congregation in a discussion about these ideas. Don’t just talk about these ideas. Do them! Post comments telling us about what happened, the people you connected with, and what you learned from the experience. So, what do you say? Are you in? How do you plan to participate? I'm looking forward to being a part of this! Looks like it is going to be pretty awesome! Yipper! Good to have you on board! As a guest blogger, I got to look through the topics that will be discussed this month. I'm excited to hear some really fresh ideas on Internet Evangelism. Stay tuned!! Me too, Nick! I'm really looking forward to seeing what happens when we bring together so many passionate, creative people like yourself sharing their ideas. Thousands of churches could easily adopt Internet Evangelism. IE Day & blog series good way to explore ideas that work. Thank you, Gordon! We're blessed to have you sharing your insight and perspective here. So little time, The good news of redemption must be revealed while there is yet time.. The internet is such a good means for this ministry. Thanks for the opportunity to participate in the conversation. well i am happy too. Jesus is the vicarious man, He represents humanity in the presence of the Father and have included us in the triune life of the Father, Son and Spirit. When He was crucified and resurrected, humanity was crucified and resurrected with Him. As it states in Colossians 3:3, our lives are now hidden with Him in God. What an amazing truth! I already do some of the ideas that are posted and am going to try the others. Thanks for a great article!!!! I'm finally getting around to having a look at this series. I have a lot on my plate at the moment, but just looking through the list, #1 grabbed me right away as a GREAT idea. And yet it seems so obvious I wonder why I hadn't already thought of it. Looks to be a great series, and I've already forwarded this link to some of our staff. I look forward to reading it. Thank you! Stop by today, just wanted to say hello and thank you. Chris, that's what I first thought when I heard Shelly talk about the Idea #1. Thanks for sharing this with your staff. Hi Edwin, thanks for stopping by. I'm not even half way thru these articles, and every single one is spot on. resemblance to the intangible similarities we all share. What WE can achieve is the sum of all of OUR abilities, determinations, faiths, aspirations, dreams and hopes. We all share the same dreams, despite how different we are taught to look at each other. We may view others as our greatest enemies, but we are truly our own greatest assets. The potential of US and OUR planet is the sum of ALL of us. ALL of our minds, faiths, hopes, fears, and aspirations. NO ONE can ever tell you differently. We as humans all share this quality, and it is no coincidence that this is so. TOO many similarities spread across the “chasms” that we are taught are there. There are no “chasms” between any of us. We share the same air, water and land. Whatever aesthetic differences there may be fade when we look beneath the surface. We were not made to fight, war, kill, segregate, hate or split apart. We have every ability to be there for each other, and every ability to solve any problem that comes OUR way. Faith in humanity is as strong as faith in ANY religion. And faith in EACH OTHER will be enough to persevere in ANY situation. Hi Bobby, I appreciate your comment, but we're not talking about a religion here. We're talking about the God who spoke the entire universe into creation with a few words. Faith in each other is great, but until we create an entire universe out of nothing, it will never compared to God's power. For all my friends, Jesus is the only way to the right Kingdom, in where we should be as the Kingdom of God wants us in pure heart and Glorify his name. For he is alive and miracle walking God, he can do anything without paying any single cent, please, believe me, trust in him and he will do great, great things upon you. Hi Shea, sure we appreciate you sharing articles posted here. When you do, please don't repost the entire article, though, post an excerpt with a link to the full article here on Christian Web Trends. Thanks! I recently joined a new social community based around the Bible Series that will be airing on the History Channel in March. I have found it a GREAT place to express my faith and to talk about it with others. I think you would really enjoy it and it would even be a good blog post to talk about it if you enjoy it as much as I do. The site is http://community.bibleseries.tv you can watch the trailers for the Bible Series too if you haven't seen it yet. I hope you like it and thank you for all the work you put into your blog! This is a great article. There are thousands of ways to share faith online! Thanks for your list. Thanks Great list of ways to share faith online.